Occasionally we have the opportunity to invite a guest into the Skirts and Scuffs fold and today’s contribution comes from someone who believes women have a place in racing. Liz Opatic is not only a mother, she’s also a blogger. In her personal blog, Girls Race 2, Opatic shares her thoughts and inspirations while profiling some of the up and coming women in the racing world. Please give Liz a warm Skirts and Scuffs welcome as she give us a look at Molly Helmuth. Molly Helmuth began racing karts when she was 11. She had a very successful racing career in the karting world and quickly progressed into racing full sized cars by the age of 14. She started off in the mini stock series at Evergreen Speedway. In 2010 she earned Rookie of the Year in mini stocks and she was invited to attend the Lyn St. James Academy. 2011 was another great year for Molly in her racing career. 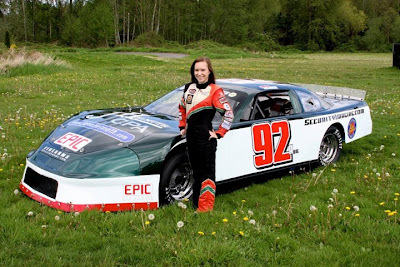 She set the track record in Mini Stocks at Evergreen Speedway. Another big accomplishment for her was making the Ron Sutton’s Winner Circle team. “Making it into the RSWC program was a huge step in my career for me. I was really excited to become a part of the family, I learned a ton from the program and it definitely gave me more confidence as a driver.” That year she raced the Pro4 truck series and made her debut in Super Late Models as well. Molly did not stop there. In 2012 she earned Washington State rookie of the year in NASCAR Super Late Models with one podium and seven top-ten finishes. She also made the list of top 500 NASCAR Late Model drivers and raced with RSWC in a Ford Focus Midget where she had three podium finishes.